The food item of the day is dried bean curd. Also know as tofu skin, yuba and bean skim it’s a product made from soybeans. Ever wonder how bean curd is made? Well, it’s made from the skin that forms as soybeans are heated. The soybeans are boiled in a shallow pan and as they are a skin forms over the top. This is collected and dried in sheets or in the case of these dried bean curd sticks they are bunched and tied together in cloth and then stewed. They will then retain their tied shape. Re-hydrated they are good in soups, dim sum wrappers, meat substitute and many other uses in Asian cooking. I’ve added bits of it to home made miso soup. How about you? 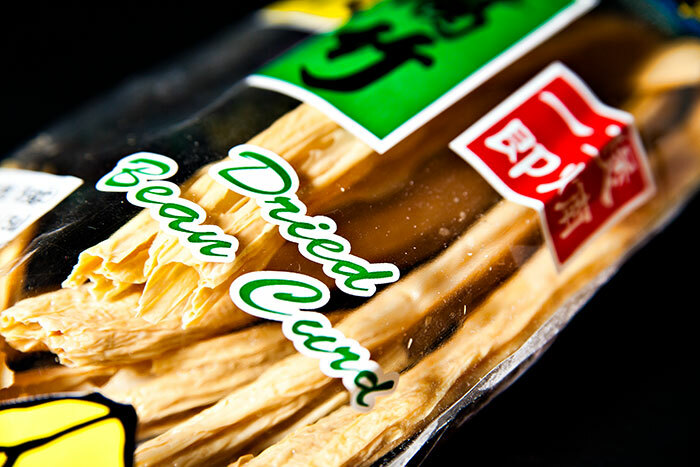 Have you tried or cooked with dried bean curd before? This photo was shot with a single Canon 430EXII and Lumiquest Softbox III camera left. I used a Canon 5DII and Tamron 28-75mm f/2.8 lens. Next post: Want To Be An Entrepreneur?